School superintendent salary data offers a unique window into the vast diversity of Texas districts, from massive to miniscule, and the way they pay their chief executives. One new trend: Performance pay. Among Texas school superintendents, Carrol Thomas of Beaumont ISD stands out in multiple ways. After a career full of accolades, he’s now the state’s highest paid superintendent, making $334,000 — more than chiefs of much larger school systems. 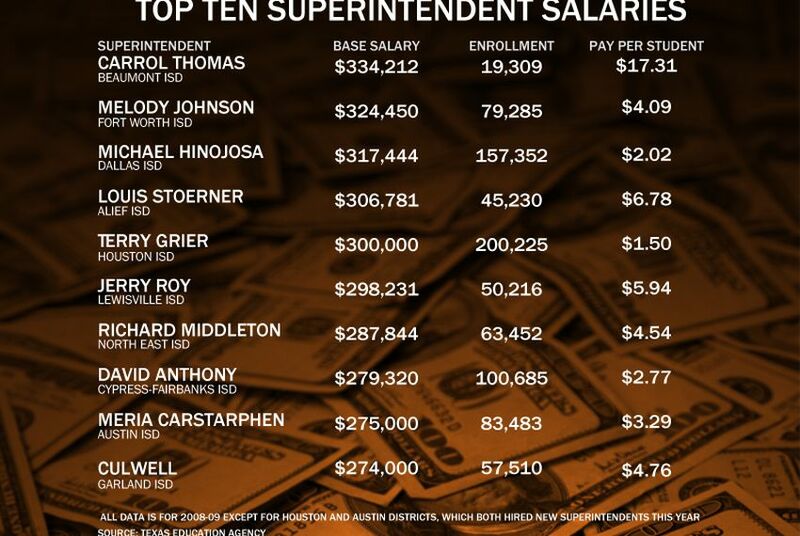 Indeed, Thomas earns $17.31 per student as chief of the 19,309-student system, according to state superintendent salary data from the Texas Education Agency. Compare that with the newly hired chief of the state’s largest district, Houston ISD’s Terry Grier, whose $300,000 salary breaks down to just $1.50 for each of that system’s more than 200,000 students. Then there’s a whole class of rural superintendents who make astronomical per-student rates because they preside over tiny “districts” — no bigger than a classroom or two. Shirley Coleman, of the 33-student San Vincente ISD, inside Big Bend National Park, earned $100,000 — or more than $3,000 per student, the highest per-capita salary in the state, according to TEA data for the 2008-09 school year. Houston, with the most students, had the lowest per-student rate. Superintendent salary data offers a unique window into the vast diversity of Texas school systems, from massive to miniscule, and the way they pay their chiefs, who turn over at a rate of 15 percent per year, about the same as teachers, according to a recent survey by the Texas Association of School Boards. In Beaumont, Thomas’s high salary may reflect his uncommon longevity: He’s been leading Beaumont since 1996 — a tenure tantamount to eternity in the hyper-politicized, high-turnover world of urban education. Across all districts in Texas, the average superintendent has served just four years, and been a superintendent in that and other districts for only seven years. The TASB study further noted that 60 percent of school chiefs are in their first position as a district leader. Thomas, who recently was elected president of the National Alliance of Black School Educators, took the system from among the state’s worst when he took over to a position of respectability today. State data shows the system has three schools ranked as exemplary; 13 as recognized; 13 as acceptable and none as unacceptable. In all, the 900 full-time superintendents (many are listed as part-time) of the diverse array of Texas school systems earned an average of $114,000 annually and $154 per student in their districts during the 2008-09, according to our analysis. TASB released only highlights of the data it collected for the current school year, rather than laying out information for each district. Their average salaries ranged from a low of $81,985 in the smallest districts, to $277,223 among those with 50,000 or more students. The TASB survey, based on 2009-10 salaries, further highlighted another emerging trend: performance pay. As the state continues to wrestle with controversial merit pay schemes for teachers, district school boards are beginning to embrace the concept for their top earners as well. The survey showed that about 10 percent of responding districts paid bonuses, up from 6 percent in last year’s survey. That doesn’t include some new high-profile superintendent searches. Both Houston and Austin, for instance, hired superintendents this year, and both drew up contracts involving performance pay incentives, said TASB’s Mary Barrett, who has worked on the superintendent salary survey for ten years. The average bonus came in at just over $6,000, she said. The contracts usually stipulate specific academic measures for the bonuses, or a specific length of time the superintendent has to stay in the district to receive the money, Barrett said. The other trend the association has seen over the last ten years, Barrett said, is an embracing of rookie leadership.